A fun little ask-the-author video. In addition, check out the full Q+A interview. The artist and inspirational art-book author Alex Mitchell is a born storyteller who loves sharing her life through art. She created a series of three poem picture books with tender and humorous poems for readers of all ages. Currently she’s happily obsessing over her latest picture book project, which you can follow on Instagram where she posts her story and illustration process. Alex Mitchell is a member of the Society of Children's Book Writers and Illustrators. Check out her SCBWI member profile and connect with her on Goodreads. An oddly charming, somewhat sad yet hopeful, little caterpillar is our model to feeling worthy in “Are You Ready Little Caterpillar.” He’s an inspiration to us not because he feels special, but precisely because he doesn’t. In this her third book in her series, Alex Mitchell reaches out to that part of us that is striving to improve, struggling to feel worthy, and putting our lives on hold trying to be something other than ourselves. As the words “are you ready” arise repeatedly in the book’s poem, the author prompts us to recognize that just like a tiny little caterpillar is born with the promise of the butterfly, we too are all on an incredible journey of personal transformation. The author encourages us to be true to who we were born to be, and in her closing commentary she speaks to the little caterpillar in each of us when she writes, “Your destiny is to grow into something beautiful and you have been ready for this since the day you were born.” This poem picture book’s creative spirit, style, and timeless message are alluring to all ages. 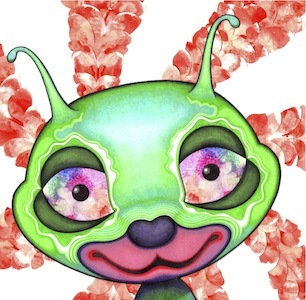 All the illustrations are reproduced from the artist’s hand-painted originals. 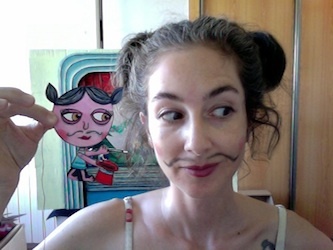 For a full book preview of “Are You Ready Little Caterpillar” and purchase info go to Blurb.com (http://www.blurb.com/books/4114245-go-ahead-be-a-monster-but-don-t-forget-to-smile). 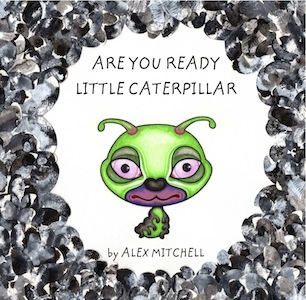 You may also purchase “Are You Ready Little Caterpillar” at Amazon.com (amazon.com/author/alex_mitchell). Rendered in rhyme and colorful imagery, “My Colors Inside” shows a little girl who unafraid to express herself, vividly changes colors in sync with her feelings. With huge expressive eyes, she impishly looks up from the pages and lets her true colors shine for all to see. 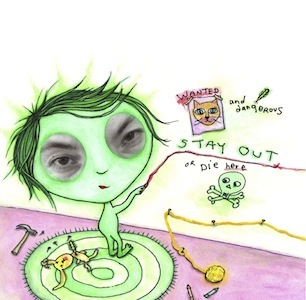 Her eyes are none other than the author’s own, pasted on to create the illustrations. And so, in this her second book in her series, you’ll find Alex Mitchell herself looking up from the pages as if to nudge us to see if we too want to be “wild” again. For in “My Colors Inside” she encourages fearlessly expressing ourselves in order to recover lost feelings of who we are deep down inside. “No one can be better at being you than you,” she asserts in the book’s closing commentary, where she reveals her personal thoughts about growing up, feeling wild, and being real. This bilingual poem picture book’s creative spirit, style, and timeless message are alluring to all ages. All the illustrations are reproduced from the artist’s hand-painted originals. A complete translation into Spanish is included. For a full book preview of "My Colors Inside" and purchase info go to Blurb.com (http://www.blurb.com/books/5038601-my-colors-inside). 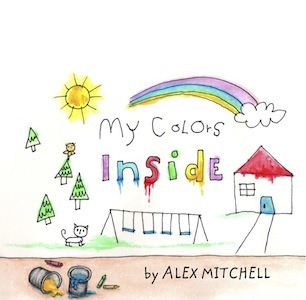 You may also purchase “My Colors Inside” at Amazon.com (amazon.com/author/alex_mitchell). 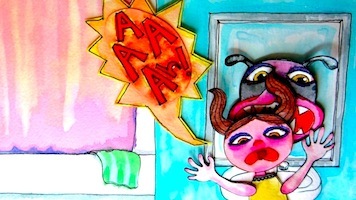 From the start of Alex Mitchell’s book, “Go Ahead, Be A Monster, But Don’t Forget To Smile,” she dares her readers to feel angry, annoyed, impatient, and needy, just like her outrageous monsters. Written with the conviction that although emotions may overwhelm us, they do not define us, the author then slowly encourages her readers to look deeper and recognize their true miraculous nature. From her unique perspective of life as an artist, this bilingual poem picture book is a spirited invitation to smile and remember who we are deep down inside no matter what we’re feeling. In the book’s closing commentary the author reveals her personal thoughts about being an artist, exploring monsters, and feeling alive. And although she had a young audience in mind when writing this book, its creative spirit, style, and timeless message are alluring to all ages. All the pages are reproduced from the artist’s hand-painted originals. A complete translation into Spanish is included. 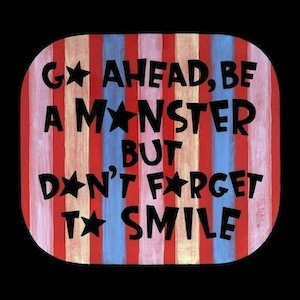 For a full book preview of "Go Ahead" and purchase info go to Blurb.com (http://www.blurb.com/books/4114245-go-ahead-be-a-monster-but-don-t-forget-to-smile). You may also purchase “Go Ahead” at Amazon.com (amazon.com/author/alex_mitchell).